Before I went to sleep, I hoped that my tailwind would last throughout the night; however, that same wind that pushed me along yesterday shifted slightly to the North and brought a continuous series of flurries, and at times, full-fledged snow storms. In the tent before packing up, I thought it was rain, but I was sorely mistaken. The wind was swirling gusts that alternately pushed me forward and blew me off the road. It was difficult to get in a good rhythm. For a while, the thought entered my head that it was too cold to be biking, but then I remembered the times I've cycled in Antarctica (-30 F) and last year's Fat Bike trip to Yellowknife in Canada just to name a few. Still, biking in the cold and wind at a fast pace poses a unique challenge: working at an aerobic level where you sweat while having to wear enough protective layers to minimize the windchill. 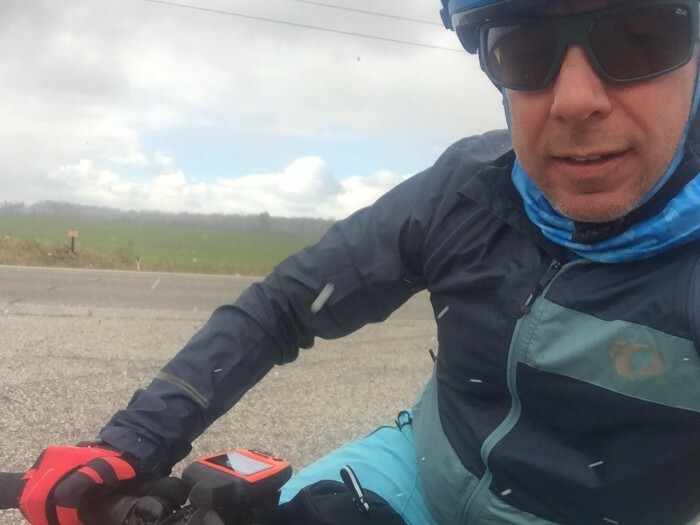 While I managed to stay warm on the bike, after every stop I was teeth chattering cold. Still, it was better than a headwind. My route continues to take me through rural Wisconsin and today I rode from Chippewa Falls to Wisconsin Rapids. I stayed on county highways but I could have just as easily ridden on the hundreds of paved township roads (where I live in Colorado there are only three paved roads). Along the way I passed one small farm house after another. Cows, corn and not much else. For a few miles, I watched red polka dots line the shoulder until I realized that I was pedaling through cranberry country. Huge rectangular bogs stretched into the distance. Too often, I wanted to stop and take pictures, but I was too cold and pressed for time to stop. A few people I met today asked where I was biking and in between shivers I tried to share my story - or at least a small part of it. I like telling people I grew up in Wisconsin. It fills me with a lot of joy to know that I am from here. I have moved around so much throughout my life and it feels good to have these roots. My kids are mountain born and will never know the rolling farmland, rich soil and hardwood forests of my home state. For those of you interested in giving the gift of adventure to today's youth. Please support my effort to raise $5000 for Riveredge Nature Center's summer camps. Donate here and check out the great 'thank you' swag as well.